ATLANTA, GA, February 05, 2019 /24-7PressRelease/ — A testament to its ongoing dedication to using energy and resources wisely, the Atlanta Airlines Terminal Company (AATC), which operates Hartsfield-Jackson Atlanta International Airport (HJAIA), was the largest recipient of Georgia Power energy efficiency rebates during fiscal year 2018; totaling $971,497. Over the past two years, AATC has received a total of $1,184,852 of energy efficiency rebates. 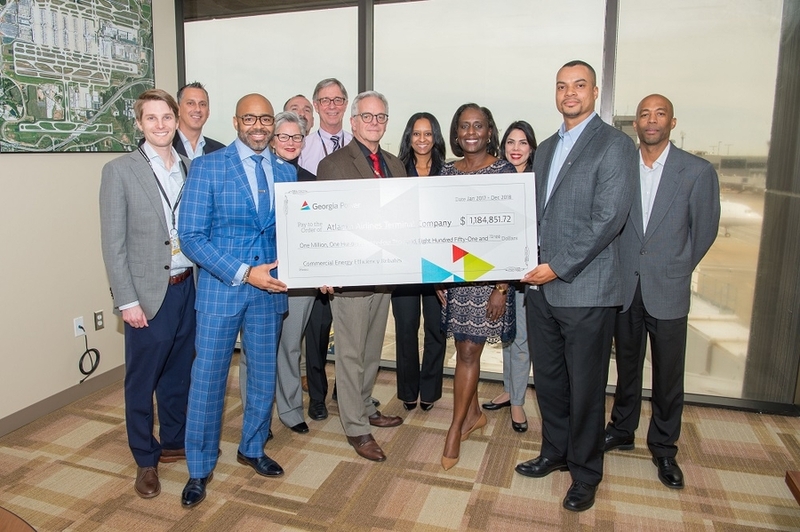 Georgia Power, the largest subsidiary of Southern Company, recently presented a ceremonial check to AATC in recognition of its continued energy efficiency focus. As part of its plan to reduce energy usage at the world’s busiest airport, the Atlanta Airlines Terminal Company, which operates Hartsfield-Jackson Atlanta International Airport partnered with Atlanta-based Energy One Consulting to audit and optimize energy usage at the 7.2 million square foot facility. Changes resulted in more than $5 million in savings, projected to increase by $2.5 million per year. Overhauls of lighting, HVAC controls and other systems at Hartsfield-Jackson lowered the airport’s energy usage by a notable 11 percent.